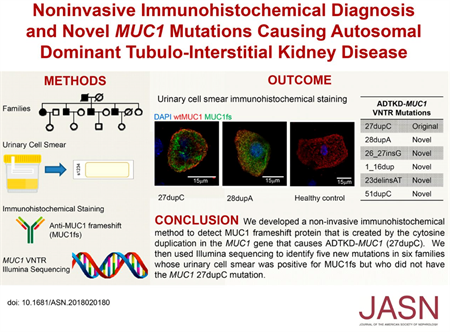 Background Autosomal dominant tubulointerstitial kidney disease caused by mucin-1 gene (MUC1) mutations (ADTKD-MUC1) is characterized by progressive kidney failure. Genetic evaluation for ADTKD-MUC1 specifically tests for a cytosine duplication that creates a unique frameshift protein (MUC1fs). Our goal was to develop immunohistochemical methods to detect the MUC1fs created by the cytosine duplication and, possibly, by other similar frameshift mutations and to identify novel MUC1 mutations in individuals with positive immunohistochemical staining for the MUC1fs protein. Methods We performed MUC1fs immunostaining on urinary cell smears and various tissues from ADTKD-MUC1–positive and –negative controls as well as in individuals from 37 ADTKD families that were negative for mutations in known ADTKD genes. We used novel analytic methods to identify MUC1 frameshift mutations. Results After technique refinement, the sensitivity and specificity for MUC1fs immunostaining of urinary cell smears were 94.2% and 88.6%, respectively. Further genetic testing on 17 families with positive MUC1fs immunostaining revealed six families with five novel MUC1 frameshift mutations that all predict production of the identical MUC1fs protein. Conclusions We developed a noninvasive immunohistochemical method to detect MUC1fs that, after further validation, may be useful in the future for diagnostic testing. Production of the MUC1fs protein may be central to the pathogenesis of ADTKD-MUC1.